The Cisl Study Center stands on the hill rising from Florence towards Fiesole, close to S.Domenico. It is the college where the organization 's employees train and study at national level. The center was founded in 1951 with the aim of offering it's own employees a professional and cultural training programme appropriate to the needs of the union. In this way, CISL's decision to be a union based on autonomy, pluralism, democracy and solidarity was strengthened. The Study Center has a structure which for some time has provided a base for anyone needing the space and means necessary for personal enrichment on a cultural level, even beyond union training. 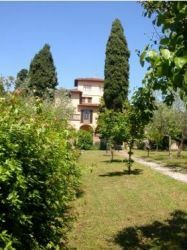 The beauty of the Study Center is due not only to the nearness of the historical centers of Florence and Fiesole, but also to its position in the middle of Tuscany's green countryside. All in all, a calm, attractive environment in which to study and live in a quiet atmosphere. The Study Center actually dispose of 20 double rooms and 34 single rooms all with private bathroom with shower . All rooms have recently been renewed and they now all dispose of safety box, hairdryer and Tv. Leave the highway at the exit: FIRENZE SUD. Follow the signals to the left until you reach Fiesole, Via San Domenico. Via della Piazzola is on the left just after the Hospital of Camerata. The parking of the Study Center is accessible from Via Piazzola, number 69 / A. From Santa Maria Novella train Station take bus line n. 7 to Fiesole (stop is in Piazza Adua, about every 15 minutes). Get off at the stop named "Ospedale di Camerata" (Hospital of Camerata). Parallel to the hospital is located via della Piazzola, after 300 meters is located the CISL Study Center. The connection with the Study Centre is possible using the tramway (Line T2) to the end of the line in Piazza dell'Unità. From there you can reach Largo Alinari where the bus terminal 7 is located. A quickier connection with the Study Centre is possible using a Taxi. The trip of about 20 minutes cost about 15-25 Euro.